Several species of spider mites can damage turfgrass in Colorado: clover mite, Banks grass mite and brown wheat mite. Most damage occurs during early to midspring. Damage to turfgrass is primarily related to dry conditions and turfgrass stressed by drought. Clover mites can be a serious nuisance pest when they enter buildings in spring. Banks grass mite is the most difficult species of mite to control in turfgrass. If left alone, spring clover mite problems will end on their own by the end of May. Clover mites are considered cool-season mites, in contrast to many other spider mites that cause greatest damage during warm months. 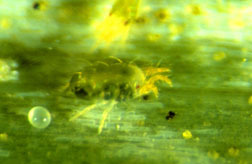 Many species of mites are common in Colorado turfgrass. Some, such as the oribatid or “hardshell” mites, are important in the breakdown of thatch and the recycling of nutrients. Other are important predators of pest insects and mites. Three spider mites species are among those that damage Colorado turf: clover mites, Banks grass mites and brown wheat mites. Figure 1. Clover mite with egg. Clover mites (Bryobia praetiosa) are a common type of spider mite in Colorado. They breed outdoors on turfgrass, clover and other plants from fall through early May. Clover mites are smaller than the head of a pin and range in color from reddish or brown to dark green. Under close examination they have an unusually long pair of front legs, which distinguishes them from the common spider mites found on garden plants. 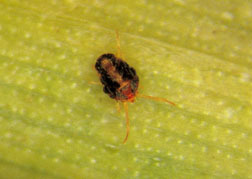 Clover mites are most often encountered as nuisance pests in homes. During warm days in fall and spring, large numbers of clover mites may become active and enter homes through cracks around windows and doors. South-facing walls usually are more heavily infested. 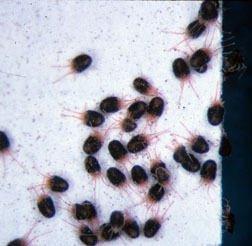 The crawling mites may spread to walls, curtains, furniture and carpet. Typically, clover mites are described as “walking dust specks.” Although they do not bite people, transmit diseases or feed on household furnishings, they can be a serious nuisance. When crushed, clover mites leave rusty red stains that are noticeable on white surfaces. During early to midspring, clover mites also may damage turfgrass around building foundations and in other warm, dry areas of a lawn. Feeding damage appears as small, meandering silver streaks in the leaves. When mite populations are high, leaves may be extensively injured and die. Areas of grass extending several feet from the building foundation may be totally killed, appearing as light brown, irregular dead patches. Clover mite injury to turf is commonly mistaken for winter kill and usually is found in the same sunny, dry areas of the lawn where winter drying problems occur. Furthermore, almost all injury occurs within 10 feet of a building, tree or some other upright surface. This is because clover mites periodically climb out of a lawn to shed their old skins and lay eggs. Clover mites produce two or more outdoor generations during the cooler seasons, feeding on grasses and other plants. However, turfgrass injury occurs only early in the growing season, from February to May. As temperatures warm in late spring, clover mites produce dormant eggs that do not hatch until the return of freezing temperatures in fall. Because of this habit, clover mites are considered cool-season mites, in contrast to many other spider mites that cause greatest damage during warm months. Figure 2. Clover mites on sticky card. Migrations of clover mites into buildings can be largely deterred by keeping grass and other host plants away from the base of the foundations. Usually a plant-free barrier of about three feet will be sufficient, although sometimes this may also be crossed. Since clover mites almost always enter the sun-exposed sides of buildings (i.e., south, west) this barrier is best established in these areas. Carefully sealing/caulking all exterior openings through which mites enter can also prevent indoor migrations. Give particular attention to cracks around windows. Clover mites migrations can also be prevented by use of a fine layer of various dusts around windows and other points of entry. Talc-containing baby powder, diatomaceous earth, and even baking soda or corn starch may create an effective barrier through which clover mites can not pass. Clover mites should not be crushed, as they will leave a rusty stain, but can be vacuumed. Left alone, clover mite problems end on their own with warm weather in May or early June, forcing them into summer dormancy. Clover mite populations on lawns can be greatly reduced by providing some supplemental watering to areas where clover mites develop, such as warm, dry areas at the base of sun-exposed walls and around evergreens. This can be supplemented with spot spray treatments of insecticides in those areas where clover mites develop. However, presently there are no highly effective chemical controls for clover mites. Insecticide formulations labeled for use on lawns and that have either the active ingredient bifenthrin or lambda-cyhalothrin are most likely to assist in control of clover mites. Figure 4. Banks grass mite turn injury. 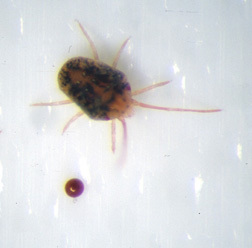 Banks grass mite (Oligonychus pratensis) is a common mite species in Colorado. It is a serious pest of corn and also damages drought-stressed turf. It causes grass to turn a bleached straw color, often killing it rapidly. The Banks grass mite adapts more to warm weather than the other common turf damaging mites and is found throughout most of the growing season. Banks grass mite differs considerably in appearance from the other turf-damaging mites. It is smaller and lighter in color. During most of the season, it is green; the young stages are a paler color. During periods when the mites run out of food or environmental conditions are unfavorable, they may temporarily turn bright red. This mite lacks the elongated front pair of legs of the clover mite. It is related to the spruce spider mite (Oligonychus ununguis), a common pest of evergreens but with different feeding habits. Banks grass mite is more destructive to turf than other turfgrass mites. In early stages of feeding injury, there is small, white flecking (stippling) similar to that of other mites. A slight purpling of the injured grass blade may be observed, which also is associated with brown wheat mite injury. Dead grass takes on a brownish-yellow color and the blades are stiff. Under favorable conditions, severe injury can progress rapidly. Almost all serious injury by Banks grass mite is related to drought stress. Banks grass mite is a difficult species to control with pesticides. Probably most effective are turfgrass products that contain either lambdacyhalothrin or bifenthrin as the active ingredient. These are sold under several trade names. Base all control programs on adequate water to the site. This includes fall and winter watering as needed, since populations of the mites can build up during this period. Under conditions of drought, control of the mite is often unsatisfactory. The brown wheat mite (Petrobia latens) occasionally damages turfgrass during spring, similar to the clover mite. Problems generally are associated with areas of drought stress and excessive winter drying. However, unlike the clover mite, populations are not so concentrated around buildings or trees. South-facing hills and highway medians are typical areas where turf damage by brown wheat mite can be expected. Adequate winter and spring watering are important in limiting infestations of brown wheat mite. If conditions promote turfgrass growth, the plants usually outgrow injury. Brown-wheat mite appears to be susceptible to insecticides used for control of other turfgrass mites. 1Colorado State University Extension entomologist and professor, bioagricultural sciences and pest management. 5/94. Revised 6/13.